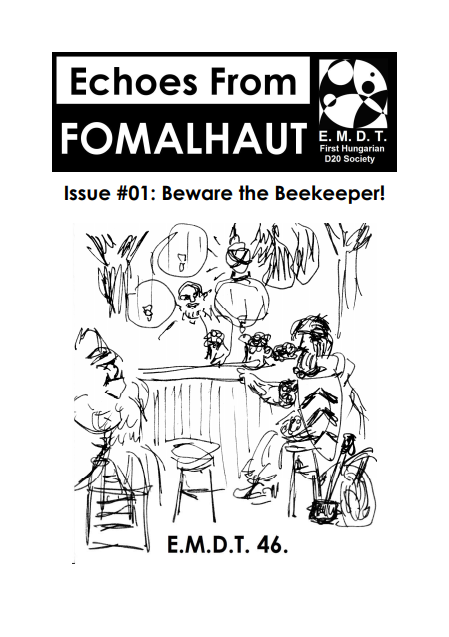 Echoes From Fomalhaut is an old-school RPG zine focused on adventures and game-relevant campaign materials. Each issue is planned to feature a larger adventure module, accompanied by shorter scenarios, city states, and other things useful and interesting in a campaign. Rules-related material will be limited to a few pieces of interest. A long time ago, Judges Guild’s campaign instalments established the general idea, and that’s the road I intend to follow. A small city-state? An interesting wilderness area? An island ruled by a society of assassins? Guidelines for magical pools? All that kind of stuff. The content will feature both vanilla and weird fantasy, mostly drawn from our home games, with occasional contributions by guest authors from the Hungarian old-school scene. Most of the articles will follow AD&D conventions, but remain compatible with most OSR systems – and there will be detours. Bazaar of the Bizarre (2.5 p): a 1d100 table to generate strange merchants, caravan guidelines. The Rules of the Game (0.5 p): sets out the conventions followed in the zine. The Singing Caverns (16 p): a two-level cavern system with 49 keyed areas, inhabited by orcs, bandits, and the mysteries of a bygone age. Philtres & Dusts (3 p): a sampler of magical potions and dusts. Red Mound (3 p): a mysterious adventure location found in the wastelands. Morale & Men (1 p): a simple, fun set of follower and morale rules from a Hungarian retro-clone, written by two guest-authors. The Mysterious Manor (9 p): the manor house of an extinct noble family, now with new occupants... or is there more to it? 23 keyed areas. Yes, there is a downloadable preview (see below)! I have always wanted to publish homemade game materials, an idea that has grown on me ever since I fell in love with the rough charm of Judge Guild instalments. 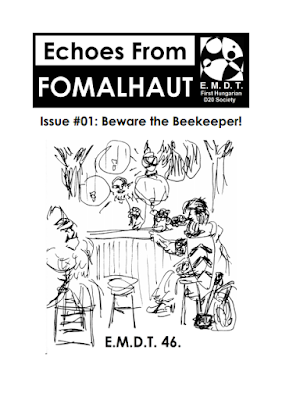 I released my first PDF adventure in 2001, and the first printed one in 2003 (through my E.M.D.T. – First Hungarian d20 Society label). Over the years, I have mostly stuck to free PDF releases and community fanzines (with the occasional detour, like the Helvéczia boxed set), but something has always been missing. This is an opportunity to fix that. Finally. The zine will debut with a pre-release version at Kalandorok Társasága VII (“Society of Adventurers VII”), a Hungarian game convention held on 24 February 2018. The print edition is expected shortly afterwards, in early March. A PDF/POD version will be published through RPGNow with a delay of a few months. A print issue is expected to sell for $8.00 plus priority shipping ($3.5 to Europe, $4 to the US and worldwide). The price for the PDF edition is expected to be set around $5. POD is still TBD. All buyers of the print edition will receive a free copy of the PDF edition at the date of its publication. This is slightly above the average in zine pricing (I did an Excel comparison of 39 OSR and indie zines, and they come out at $11.44 for print/worldwide), but gives you some 14,800 words worth of content per issue (not including the OGL and front/end matter), pays for the commissioned artwork, and Hungary’s prestigiously large tax wedge. Since I had to set up a sole proprietorship to get this thing off of the ground, I am thinking about using the opportunity to republish some of my older adventure modules with new artwork in a reader-friendly format. Stay tuned! This is great news - I eagerly look forward to supporting this endeavor! Definitely interested and will add it to the Fanzine Focus series too. Would you be willing in a post to explain why it is necessary to set up a business for something that looks like it would easily fly under the radar; and what steps you need to take now that you have done it. Why are there so many one man 'businesses' in the osr? Is there a ceiling, say a thousand copies, below which the authorities won't bother you. And how are you negotiating the use of D&D concepts and terms? Here is Act 1995/CXVII on the Personal Income Tax, § 3/46: "Business activity: an activity carried out in a businesslike, lasting, or recurring manner, if it is pursued for exchange value, or results therein, and its pursuit is undertaken on an independent basis. The key phrase is "lasting, or recurring", and this is the yardstick the taxmen can use at their discretion to determine is something is a business activity or not. In practice, selling pieces of a book collection on an online marketplace would not count as a business, but regularly selling books at the same place would. Flying under the radar is increasingly risky if things scale up from the "20-30 copies" range, and the radars are getting better at, say, finding an undeclared revenue stream on a random tax audit. Not worth it. Also, registering a sole proprietorship has some further benefits that might come in handy at my day job. Ta. You have a ton of material already written so I can see you rolling it out like a jr. Raggi jr., Systema Tartarobasis for instance. How does one avoid treading on D&D terms and concepts so as not to get a wrist slap? The million dollar Matthew Conville you mentioned on g+, how does he explicitly write for 5e? I have been catching up on some Matthew Colville youTube videos. He comes across like an extremely intelligent straight dude. The plan is to test the waters with smaller releases to learn the process and the pitfalls before risking a larger project. Not on Raggi's level, though; he is full-time, which has no attraction to me. I'll follow the same legal path as all the other old-school creators have followed (including my free releases): the OGL, applied to old-school gaming. This is a tried and true way. Colville's name rings a bell from a long, long time ago. He was already around in the early 2000s, but no idea where. He is using the license released specifically for 5e, which is much more restrictive than the OGL. Great news, looking forward to this! I will definitely be ordering a copy. Now come on. You will be receiving a copy. You are not asking with honest intentions.